INDIANAPOLIS — Twenty years ago the world of Indy car racing changed dramatically with the introduction of a new technical formula backed by the fledgling Indy Racing League. The 1997 season was one of teething pains for the naturally-aspirated V-8 engines built by Oldsmobile and Infiniti, wheeled by a host of fresh new names that included a brash, young Indiana driver named Tony Stewart. For those of us who covered the sport during this era, it was a fascinating and frustrating time. A brief recap, summarizing three decades of wrenching upheaval and near-constant strife in one paragraph: USAC controlled championship racing until the late 1970s when a group of team owners engineered a coup d’état in forming Championship Auto Racing Teams. CART was then counter-challenged in 1995 by the debut of the IRL, with the idea that championship racing had become too Eurocentric and had abandoned the sport’s oval-track heritage. The CART versus IRL conflict dominated motorsports coverage at the time. It was an intensely difficult struggle that strained every fiber of the sport, and as people picked sides it literally severed decades-long friendships. 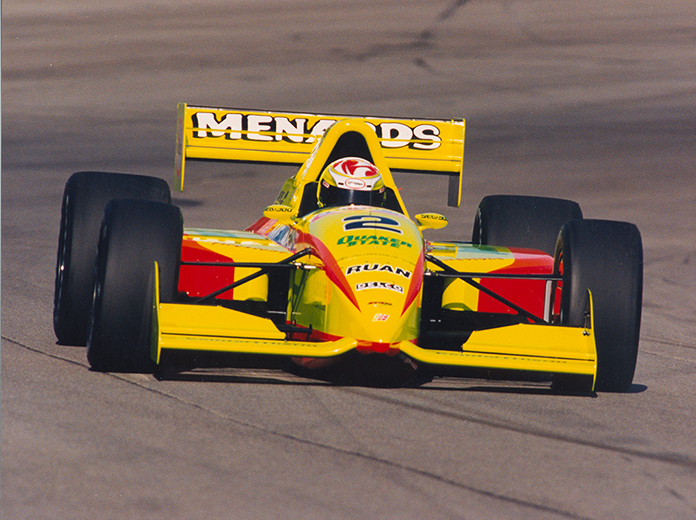 As the conflict rolled on through the following decade, CART eventually morphed into the Champ Car World Series and ultimately went away completely as the sport was once again reconciled under the IndyCar banner. The upside of the period — loosely defined as 1996 to 2002 or so — was the introduction of countless new names and faces to the sport. The racing itself was entertaining and, at times, sensational. There have been millions of words written about “the split,” as it was often referred. Surprisingly, nobody has stepped forward to write the definitive book on the subject, which — if done properly — would be fascinating reading. That leaves us to think back to those years when the IRL was alive and filled with promise. The new technical formula brought great uncertainty and lots of stumbles, and a number of new ideas and possibilities, which was of great appeal to many. It was imperfect and that was profoundly interesting. There were those who argued passionately that this new version of the sport was a tragic departure from the CART version; they never seemed to comprehend that for many of us that was precisely the appeal. Suddenly, it was possible for a young USAC champion —Stewart — to get a shot in championship cars. Prominent drivers of the era included Stewart, Scott Sharp, Sam Schmidt, Mark Dismore, Greg Ray, Sam Hornish Jr., Buddy Lazier, Eddie Cheever, Billy Boat, Jeff Ward, Kenny Brack and Davey Hamilton. As open-wheel fans flocked to the speedway to cheer them on, Steve Kinser (1997) and Jack Hewitt (1998) raced at the Indianapolis 500. Equally interesting were the IRL teams. A few, such as A.J. Foyt, Hemelgarn Racing and Team Menard, had previous tenure in the sport. But a number of new entities quickly rose to prominence, including Kelley Racing, Panther, Dreyer & Rheinbold, Cahill, Treadway, PDM, Immke, ISM, Pagan, Sinden, and at least a half-dozen upstarts that were in for a few races. Venues? Walt Disney World Speedway, Phoenix Int’l Raceway, Kentucky Speedway, Las Vegas Motor Speedway, Dover (Del.) Int’l Speedway, New Hampshire Motor Speedway and Pikes Peak Int’l Raceway were frequent stops. And of course there was Indianapolis, where 40-plus cars fought for a starting spot in 1998. Perhaps most notable was Texas Motor Speedway, where some extremely entertaining and competitive racing was displayed. Even the behind-the-scenes faces had changed. Engine builders, suppliers, public relations people, sponsors and their reps, media people … it was as if the entire landscape had been populated by a completely new cast of characters. Time, however, changed everything. Eventually, the oval-centric ideas and personalities were overwhelmed and overmatched by the sport’s perpetual tilt toward Eurocentric ideas. Capped engine costs, an all-oval schedule and an emphasis on American short-track talent all went by the wayside. By the time the sport was officially reunified in 2008, virtually every vestige of the original philosophy of the IRL had disappeared. Even the name — Indy Racing League — was quietly pushed to the margins and removed from the official vocabulary. You can’t help but wonder what’s become of some of the faces and names of that era. It would be fascinating to create some sort of IRL reunion, where a memorable and unique chapter of the sport could be celebrated. Perhaps it will never happen. Perhaps people would prefer that all those faces and names be conveniently forgotten, like the era itself: best that we don’t talk about those things, you know. But some of us will always have good thoughts — and an abundance of respect — for an eager and enthusiastic group of people who seized the opportunity to be a part of the sport they love. Contrary to what some might want to believe, it was a most interesting time.